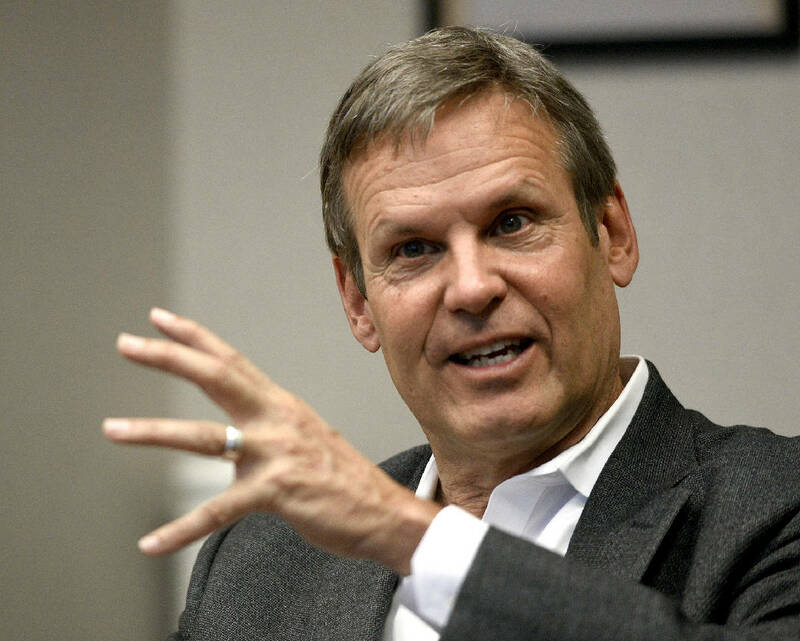 Republican gubernatorial candidate Bill Lee spoke to the editors of the Times Free Press at the newspaper's office on September 28, 2018. On Thursday, Oct. 4 at 8 p.m. and again on Sunday Oct. 7 at 7 p.m., WTCI-TV, Channel 45, will broadcast an hour-long "Conversations with the Candidates" that both Karl Dean and Bill Lee" with an encore broadcast on Sunday, October 7 at 7 p.m. The "Northeast Tennessee Gubernatorial Debate" will air on the Tennessee Valley's community PBS station on Tuesday, October 9 at 8 p.m. and repeat on Sunday, October 14 at 7 p.m.
Bill Lee may run a $225 million-a-year business and live in the wealthiest county in Tennessee, but when the GOP nominee for governor in Tennessee connects to the internet at his cattle farm in Fernvale, Tennessee, he has to use a satellite dish. "Like a lot of rural areas, we still don't have broadband and when there is a storm, we play a lot of Yahtzee at home," Lee quipped Friday. But Lee said the lack of access to high-speed internet service is no fun and games for many rural residents. For students to study, workers to perform at-home jobs or doctors to practice telemedicine, having access to broadband is critical. A study by the Tennessee Department of Economic and Community Development in 2016 found that 13 percent of all households in Tennessee lack any access to broadband internet service, leaving 834,545 people without sufficient web connections to conduct most e-commerce. "Lack of broadband service really does inhibit the ability of many rural areas in our state to prosper," Lee said during a meeting with reporters and editors of the Chattanooga Times Free Press. To broaden broadband and bridge Tennessee's digital divide, Lee said he is open to the idea of lifting the territorial ban that now limits where municipal utilities such as EPB can extend high-speed broadband. EPB, the city-owned utility that began offering the nation's fastest citywide internet service nearly a decade ago, is banned under state law from offering its broadband services anywhere outside of its power service territory in the Chattanooga area. "Chattanooga has a world leader in innovation and thought around the importance of communication services at EPB," Lee said. "I met with EPB recently and asked them what they could do to expand broadband if we unleashed them." In neighboring Marion and Bradley counties, an estimated 15 percent of the population lacks broadband and in nearby Sequatchie County, almost half the residents lack high-speed internet options. EPB and other municipal utilities have offered to work on extending their broadband services into underserved areas, but the state Legislature in 2016 authorized only electric co-ops and rural telephone companies to expand into telecom in competition with investor-owned phone and cable TV companies like AT&T and Comcast. Former Gov. Phil Bredesen previously sought to allow municipalities the freedom to expand rural broadband and is now urging the Tennessee Valley Authority to broaden its mission to expand broadband services across its region, just as it brought electricity to rural areas in the 1930s. At the urging of Gov. Bill Haslam, the Tennessee General Assembly adopted the Tennessee Broadband Accessibility Act two years ago to provide $45 million in grants and tax credits to subsidize broadband service in underserved rural areas and to allow electric cooperatives to expand into telecom. But legislative proposals to allow municipalities to expand broadband outside of their current service territories has been blocked in the General Assembly. Lee, a self-described conservative who said he doesn't believe government can solve all problems, said he wants both public and private telecom providers to work on finding a solution to expanding broadband coverage in rural areas. "This is possible if we just bring all of the interested parties together and figure out who is going to contribute what and who is going to give and take so that the citizens of Tennessee can move forward," Lee said. "I think we're not that far from it and we can do it. I think there is enough recognition and understanding of the fact that Tennessee is not going to lead the country if we can't figure out how to get technology into our far-reaching communities." Former Nashville Mayor Karl Dean, Lee's opponent in the Nov. 6 election contest, has voiced even more support for rural broadband, advocating for both more state funding and new initiatives to expand high-speed internet into rural areas. "The first step should be to partner with utilities and the private sector to set a date for universal access and then work to get it done," Dean said in a statement Friday. "It may require an investment from the state and we should be willing to make that investment in rural Tennessee." In January, the state announced it was awarding its first $10 million in grants to utilities, phone cooperatives and cable TV companies to extend high-speed internet services in 13 counties. The estimated 5,000 households that the grants will help gain broadband access represent less than 2 percent of the households still lacking broadband service. "We need to pick up the pace," Dean said.